- The shoulder support brace is made of high quality breathable neoprene material for gentle support, soothing warmth and comfort to your shoulder. - High elastic strap, which can disperse the impact of movement to protect shoulder from injury. - Hook and loopdesign, allow you to adjust the belt for maximize comfort and fit your best. - Lightweight shouldersupport helps relieve pain caused by shoulder pulls or strains, easy to wear. - Contours to your shoulder inorder to provide you with optimal support. - Ideal for basketball, tennis, volleyball, dislocated ACjoints, Labrum tear, arthritis, muscle soreness and frozen shoulder pains. - Use cold water hand washing the shoulder brace. - Do not use the washing machine dehydration; hot water washing is not available. - Do not dry clean, bleach and iron.- Wash the shoulder brace after receiving it and air dry, for eliminate odors. Fits men and women from 36"-42". Can be worn on left or right shoulder. Adjustable straps allow for a custom fit for more restrictive or less restrictive support. ERGONOMIC DESIGN: The shoulder support brace wrap the shoulder all around with gentle compression, helping to increase blood flow and reduce recovery time. Shoulder brace provides compression, support and pain relief to joints and muscles without restricting movement. EXTREME COMFORT: The shoulder support brace can be worn on the right or left shoulder. Professional Velcro closure allows you to adjust for maximize comfort and won't loosen during use. The adjustable sleeve allows you to apply pressure as needed to aid in pain relief, perfect for all men and women. BREATHABLE NEOPRENE: The shoulder support is made of high quality neoprene material, which is breathable and durable. Suitable for acute and chronic shoulder conditions, frozen shoulder pain, bursitis and tendonitis. 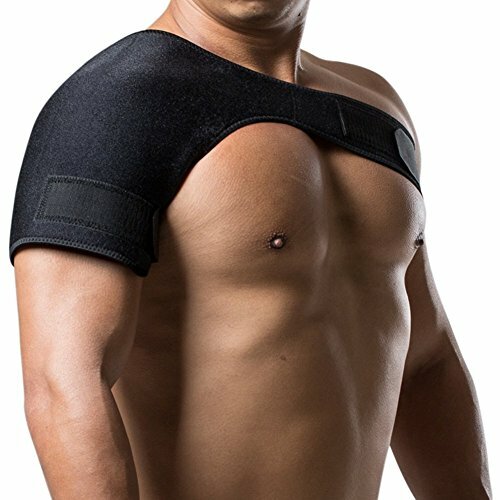 PROTECT AND RELIEVE: The Shoulder support helps protect shoulder from injuries when play basketball, volleyball, football and other sports and fitness. Relieve shoulder from strains and damaged muscles, frozen shoulder, good for arthritis and rheumatic pain. If you have any questions about this product by Kefit, contact us by completing and submitting the form below. If you are looking for a specif part number, please include it with your message.